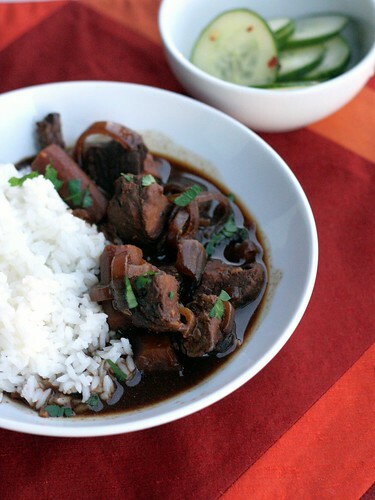 Slow Cooker Hoisin Stew – Elly Says Opa! Some mornings are just harder than others. You know, like the mornings when your normally super-chill and non-fussy baby is screaming bloody murder because you had to put a hat on him? And your 3 year old is simultaneously angry at you because you told him he can’t just stick his hand into your cereal bowl on the counter to grab a handful after you already told him no. Yeah, we have those mornings. And even without those kinds of mornings, our mornings are always tough. Between getting ourselves and two kids ready (never mind lunches, bottles, pump parts and everything else), we don’t really have a second to do anything—and that includes putting together a meal for the crockpot. There’s some irony in not having enough time to prepare a meal in a cooking vessel whose sole purpose is to, uh, save you time in preparing a meal. But this crockpot meal is perfect for people who don’t have time in the morning, because the only thing you have to do in the morning is turn the crockpot on. The meat and vegetables actually marinate in the hoisin mixture overnight, so everything is ready in the morning. And don’t worry, the night-before prep is not bad, either. It’s pretty much 6 swings of the knife and mixing together hoisin and broth, and you’re done. The result is a great twist on standard beef stew. The beef is fall-apart tender, and ginger and garlic, two of my favorite ingredients, shine. I did need to spend a little (hands-off) time making rice, but you can combat that by making brown rice on the weekends and freezing it until ready to use. That’s one of my favorite tricks for an even quicker dinner! Whisk together the broth, hoisin, hot sauce, garlic, and ginger Add the stew, celery, carrots, and onion, tossing to coat. Cover and refrigerate overnight. Transfer to a slow cooker and cook on low for about 8 hours.